Man is closest to Bonobo – a species of apes from Central Africa, which have 98 percent genetic similarity with us. Yet, they remain animals because they can’t defy rules written for them. But man can. He can choose alternatives, make rules for his social conduct and break them with impunity, and write a new smriti, or change it. Vedas say God created the world in three steps. 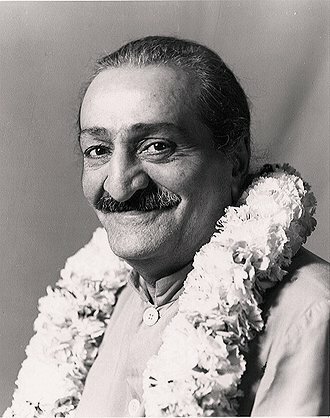 Meher Baba says that this creation process was unconscious. Step One was matter (Bhuh). A total darkness existed in the matter-energy existence (tamasagudhamgre- Nasadiya sukta.). No one to see; no one to feel; total ignorance prevailed as God in Vishnu stage was deep in sleep. Who knew this state? Perhaps none, even not gods as they were still not created, says Nasadiya sukta of Vedas. Existing then was law, which was also totally blind. Defiance came at this stage. God defied. He could not tolerate this blindness. For Him the defiance was an act to freedom. He moved from the total blindness and darkness of existence towards the light. Tamsoma jyotirgamaya. The light was life. It was the light of freedom. The enlightenment was a gradual process. Yes, it could be a sudden illumination too. Step Second was energy and life (Bhuvah). With life came some awareness and feeling of the surroundings. Yet, God was not satisfied; He defied the old stock, once again, as all that was created so far was all that was at the cost of His freedom. So, God took the Third Step (Svah) and the self became aware of surroundings. Using the same principle of defiance inherent in His nature, He said, ‘more light’. This time not by the contact alone – I must visually see, all that surrounds me. From the desire to see, came eyes and a direct vision of the surroundings. The light this time was the direct perception through the instrument of eyes. Thus the foundation was laid of animal kingdom. God became captive of his own five senses. And He became suddenly aware of His own power of creation –the Maya, which although fulfilling His all wishes, was binding and holding Him more tightly into her snares, through the laws of creation. In Tantra, these binding laws are described as Pasha and the bonded soul as Pashu. God was not satisfied with the sensual existence which made him slave to the biddings of Maya. He wanted to be free, but could not undo simultaneously what he did for so long in the journey of creation. So, He took the Fourth Step, and in the family of apes he created man. Man was turning point in the history of creation. God hid His seed of freedom in this animal existence of man. He was so much pleased by man’s creation that He gave him His power to defy, and break the law, which was his exclusive possession and none else enjoyed and shared it with Him in creation. A possession even denied to gods who can’t transgress the powers within set limits. But man, who pleased Him, was given the power to make or break the law. Man is a social being; therefore, it is non-biological and unethical for him to accumulate earth’s resources for his individual and exclusive use. Put differently, the message is that man has no right exploit others to ensure his own survival or that of his species. The God took for himself the posture of a servant of creation and slave of those who love Him. 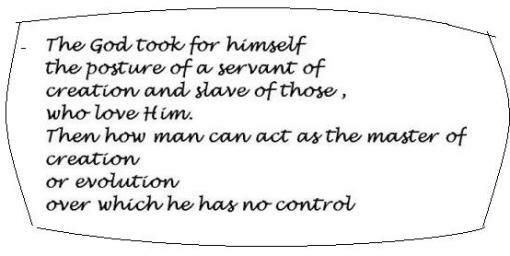 Then how man can act as the master of creation or even evolution over which he has no control. Such practices are corrupt in the eye of heavens. Did the Lord not say that- neither can a corrupt tree bring forth good fruits. (St. Matthew 7-18). His scales of judgment are equal to all. He alone has the power to punish and forgive. We can take some lessons of natural ethics from the Apes. Machines alone do not define man. If tool making is to be the criterion of man‘s speciation, apes share it with man. In so as far as equality of sexes is concerned, there is no singular divine law that has descended from heaven. Man and women are born equal. Among the great Apes however, the mountain Gorilla male is a patriarch. He is twice the size and weight of the female and protects the family. A female always selects and loves a fatty heavy hirsute male. However, this is not so with a human female, who will still like many more feathers attached to the cap of her male. One thing is clear though. Man must be able to support and protect the family. Bonabo are chimps closer to man. Primatologist Frans de wall’s studies show that Bonabo have qualities such as altruism, compassion, cooperation and empathy. All these characteristics are genetic strategies and evolved in the animals to ensure survival. There is nothing sacred or secular about them. The only sacred things are the cravings of the soul for peace, love, knowledge and freedom. Man certainly excels, but simply has no sole copyright on the book of ethics..
God created His perfect image in man. Therefore, the evolutionary destiny of man is to achieve creative perfection, in all walks of life. God takes pleasure in creation. What is creation in God’s time is evolution in human perception. A word of God is a book of infinite number of pages in human translation. When he understands it, he becomes silent. Meher Baba describes this as the Whim of God. Whim is certainly not the work of brain, seeking the truth through logical possibilities or by digital means. His will is word, which He speaks to experience the beauty, inherent in infinite possibilities of his creation game. If law be eternal, then Hannibal’s code would have been relevant even today. The truth is that in the changing reality of world, any attempt to check the change, is certainly going to meet with failure. Books howsoever holy, words, howsoever, lofty, messages, howsoever, crafty, are true till they are not replaced by higher intelligence, always incarnated in man. Intelligence may come through divine intervention or through cumulative community interactions, or a sudden self illumination; it is the only fuel which first burns the old lifeless stock. So the Law which stands valid is Change, and it applies to all divine as well as secular intelligence. The God working is God manifesting; God manifesting is God defying and changing the old code and changing the human fate as well. This is the plain logic of incarnation. This entry was posted in Meher Baba Speaks and tagged Avatar, creation, incarnation, manifestation, Meherabad. Bookmark the permalink.